Evolution is happening all around us, but the processes that create new species are also being undone at the same time. The Sugar Bird has a history written in its genes. There are no bird species that live only on St. Martin. It’s not too surprising—on a clear day you can watch birds flying across to Anguilla or arriving here from Saba. Some birds even fly thousands of miles to live here each winter. But not all birds are such avid travelers. Many of the birds on St. Martin are found only in our region. You can often tell by the names, like Lesser Antillean Bullfinch, Caribbean Elaenia, Antillean Crested Hummingbird, Carib Grackle and Green-throated Carib. Some other local birds have wider ranges, but distinct subspecies or varieties in the Caribbean. Although they can fly across the sea, they usually don’t. Like all living things in nature, these birds are in the process of evolving. Over generations, Sugar Birds on St. Martin might adapt ever so slightly to the conditions on this island. They might get better at harvesting nectar from the flowers found here or nesting out of the reach of the mongoose. These could be the first invisible steps towards becoming a St. Martin Sugar Bird, found nowhere else in the world. While this is happening, other events are reversing this evolution. A hurricane strike on a nearby island might send desperate birds here in search of food. 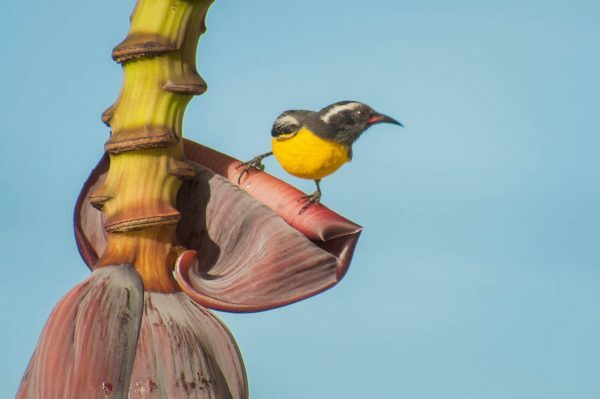 As they integrate with the local Sugar Bird population they smooth out the tiny differences that were beginning to develop in the St. Martin population. The balance of isolation and movement can create regional varieties that never develop into distinct new species. The ability to analyze genetic differences has given us a window into the subtle differences between Sugar Birds and a look into their past. A recent study compared over 40 different Sugar Birds from different areas with surprising results. 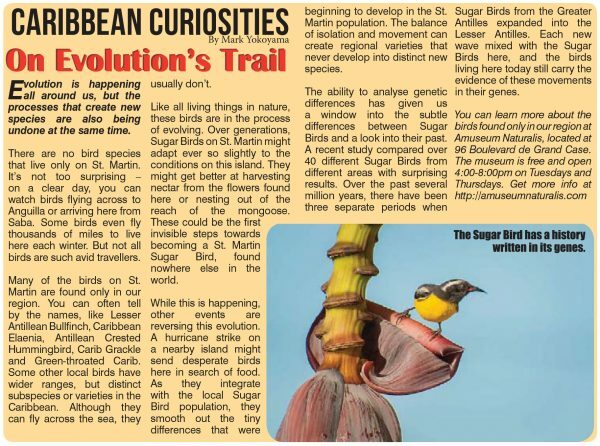 Over the past several million years, there have been three separate periods when Sugar Birds from the Greater Antilles expanded into the Lesser Antilles. Each new wave mixed with the Sugar Birds here, and the birds living here today still carry the evidence of these movements in their genes. You can learn more about the birds found only in our region at at Amuseum Naturalis, located at 96 Boulevard de Grand Case. The museum is free and open 4-8pm on Tuesdays and Thursdays. Get more info at http://amuseumnaturalis.com.